is published monthly. It is edited by Lars Björn and Piotr Michalowski with additional assistance from Barton Polot (production editor and Webmaster), Margot Campos (layout), Jeff Gaynor, and Marcel Niemiec. The 22nd Edgefest was one of the very best, which is saying a lot. The festival has always presented the best in avant garde jazz/improvised music, and this year’s focus on Chicago (an Out Kind of Town) provided more cohesion to the presentation than usual. The central artist in many ways was saxophonist Roscoe Mitchell, who appeared in a small group on Wednesday, October 17, and with a large band on closing night (Saturday). The smaller group was the reunion of the Creative Arts Collective from Detroit led by guitarist Spencer Barefield, and the larger group was a reunion of the Art Ensemble of Chicago featuring drummer Famoudou Don Moye and others. Mitchell’s solos with his Detroit Friends were simply mesmerizing in their intensity and focus. There are path-breaking improvisers in all forms of jazz and Mitchell is one of them. I can only compare it to hearing Ornette Coleman live at the Golden Circle in Stockholm in 1965. 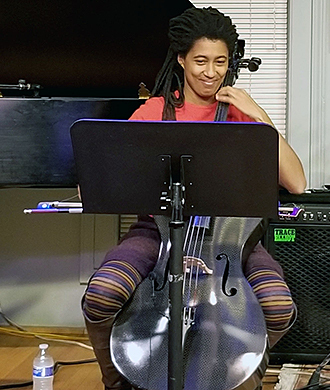 Another mature and great improviser I was privileged to hear was bassist Joelle Leandre, who treated us to a tour de force solo concert on Friday. Her technical mastery of her instrument was obvious to anyone who knows just a little about how bassists produce sounds from their unwieldy instrument. Her musical imagination seems vivid and limitless, and she plays with more feeling than most, often adding vocal nuances to her bowing and plucking. 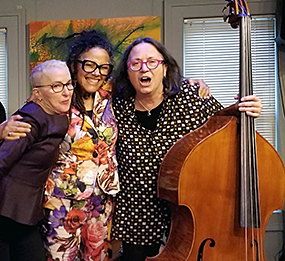 The festival also presented numerous up-and-coming improvisers whom I want to hear more from, such as cellist Tomeka Reid and trumpeter Jaimie Branch, and a slew of recently established ones like pianist Myra Melford, cellist Fred Lonberg-Holm, and flutist Nicole Mitchell. The Tiger Trio of Melford, N. Mitchell, and Leandre treated the enthusiastic audience to a compact but too brief recital on Saturday afternoon. We were the last stop on their U.S. tour, and it was pure joy to hear such musical perfection right in the Kerrytown Concert House. SEMJA sponsored residencies at Scarlet Middle School with Tomeka Reid and the University of Michigan’s Andrew Bishop during the week of the festival. Bishop also led the same students in the always entertaining Edgefest Parade around the Ann Arbor Farmers Market on Saturday morning. Edgefest Artistic Director Deanna Relyea should be congratulated for maintaining such high artistic standards for over twenty years. An amazing achievement in the ever-changing world of music.